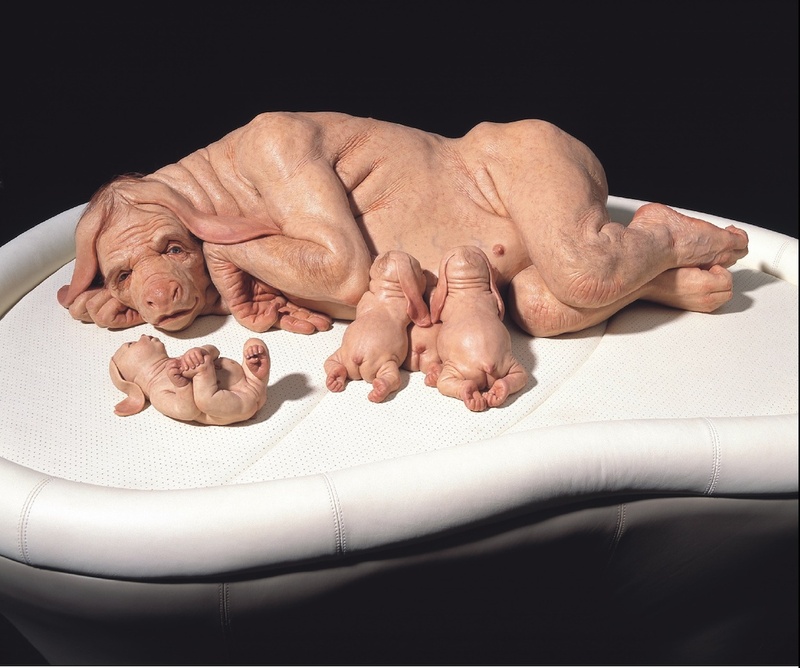 Patricia Piccinini – crackle… & splat! The creation of ‘SO1’, the first lab-generated synthetic organism, in 2002, inspired Patricia Piccinini to create her own improved version, ‘SO2’, later that year – a kind of hairless mutated platypus. 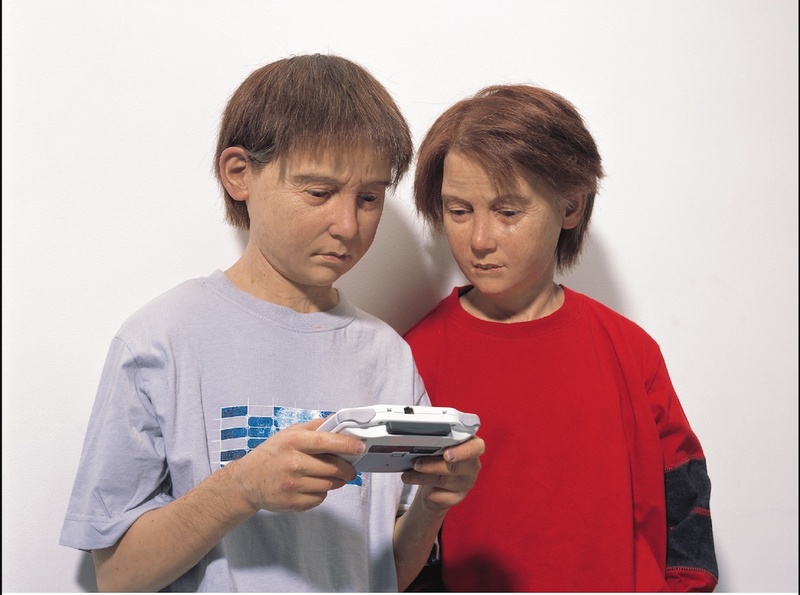 The shocking premature ageing of Dolly the sheep, the first cloned animal, who died at only seven years of age, informed Piccinini’s model of two wizened seven-year-old identical twins leaning against a wall playing Gameboy, and her preternaturally aged newborn staring wide-eyed at us from the ‘safe’n’sound’ car capsule. Plans to grow replacement human organs in GM pigs prompted her model of a reclining mother and four suckling piglets awaiting ‘harvest’. Led by developments in genetic engineering, Piccinini’s work plays out some disturbing scenarios only just beyond the realm of possibility. As she has observed, over the last ten years the human body – once thought to be unique and distinct – has come to be regarded as not only reproduceable but also miscible with other bodies, and she has envisaged this with striking realism. Indeed, the mutability of the species seems parallel to the mutability of appearances due to digital means. Piccinini has compared stem cells to digital data, calling them “biomatter for the digital age”. They are part of the same fundamental revolution in base materiality, which proposes that things might be recombined in many different ways once they have been reduced to their elements. Perhaps the genetic engineer also compares to the artist. 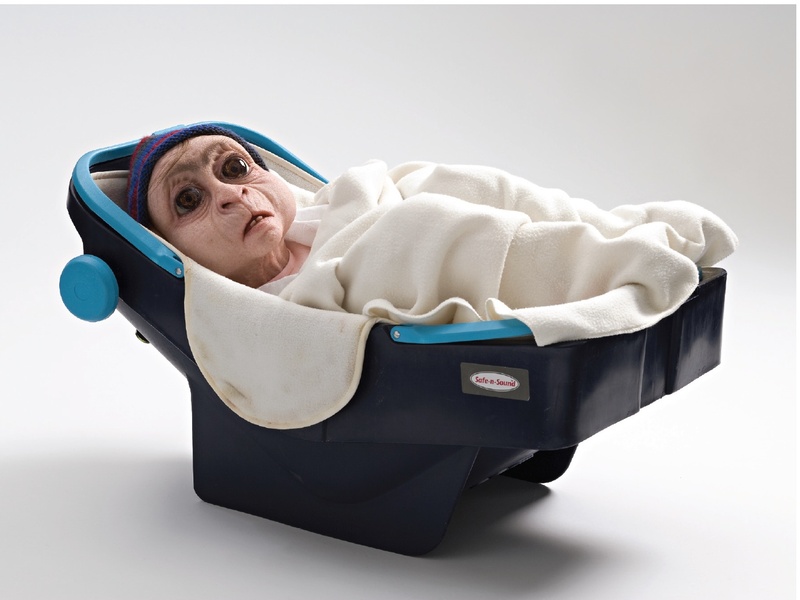 Certainly, Piccinini’s work raises similar ethical dilemmas, although she professes to act out of love (as scientists might argue, ‘for the good of mankind’). She reconfigures various species according to positive, often traditional family values, setting them in supportive domestic arrangements intended to protect and preserve the genus. In 2004, Piccinini completed a ‘bodyguard’ to protect southeast Australia’s near-extinct Golden Helmeted Honeyeater from predators and a loss of environment. Her hybrid creature is an empathetic but fierce armour-plated tree-borne ape that protects the Honeyeater and procures food for it. 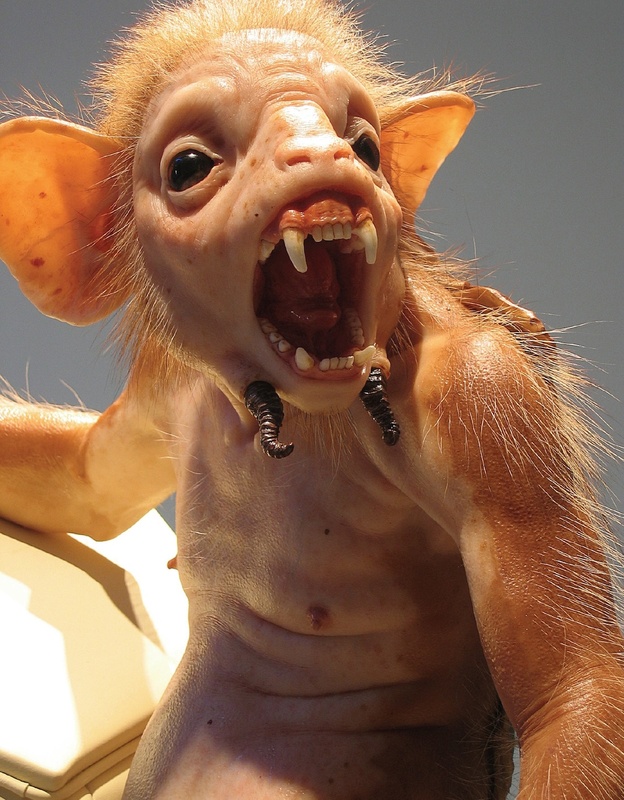 Piccinini uses digital images to illustrate the creature at large: on the fringes of suburbia, where habitat has been pushed back by urban sprawl; in the wilds disturbed by bushwalkers setting up camp; or in urban back-lots attracted by bright lights and loud sounds. Likewise, Piccinini has designed a ‘progenitor’ for the Leadbeater’s Possum and a ‘surrogate’ for the Northern Hairy-nosed Wombat, by which we might not only protect endangered species but also replenish them from ancestral stocks or simply replace them with alternative species. Of course, in many situations, one species has already been introduced to protect another. And though it seems a reasonable – even noble – application of technology to invent or modify a creature to protect others, ‘interspecies mixing’ or the ‘breeding of chimera’ is now regulated, if not banned, in many countries, including Australia (where the guidelines quote Thomas Jefferson on liberty and democracy, but warn against ‘inappropriate applications’). The moral and practical dilemmas facing scientific researchers are also ours, as we sway on the ultimate verge of genetic modification. Although we can imagine a better world, we are also well aware of the pitfalls and the unintended consequences, like the cane toad that now runs amok without predators well beyond the cane fields, or multinationals profiteering from patented high-yield seed. Piccinini’s work embodies the conundrum of ‘doing the wrong thing for the right reason’, and the results are frequently unsettling. We confront ourselves as so much abject animal matter in radically altered forms: aged children, misshapen physiognomy, suckling mothers with their litter, and fathers on all fours – or we are replaced altogether by genetically modified caregivers and companions. Although new-age chimera are intended to preserve and improve one species or another in the face of catastrophe, it’s difficult to welcome such dire transformations in our natural or normal environment; these changes render us between species, gradually ‘extinct through innovation’. Indeed, having failed to survive, we may yet succeed in removing ourselves altogether from consequence and moral judgement. But while friends and family may be replaced in these arrangements, the need to care for something will remain. Thus the motherless test-tube progenitor seeks a mother and clings ardently to the figure of Piccinini herself, who seems to recoil in surprise, though not absolute rejection. 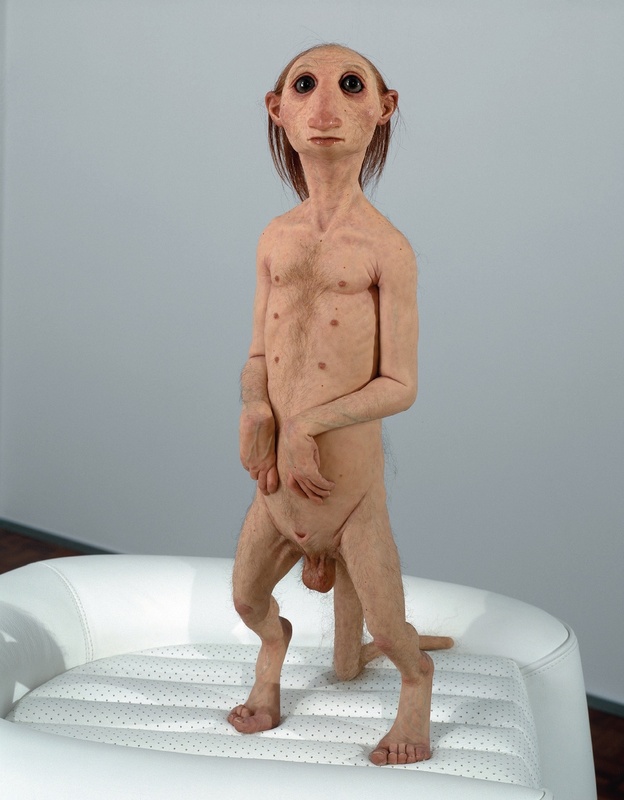 So rather than the preservation of the species, Piccinini’s work seems ultimately to promote the preservation of the capacity for love and affection in one form or another. Courtesy Tolarno Galleries, Melbourne; Roslyn Oxley9 Gallery, Sydney; and Yvon Lambert, New York.